If you want your children to grow up to be big and strong nerds just like you, you’ve got to start teaching them young. And let’s face it, 11 year olds aren’t going to sit there and listen to you read from a C++ book. That’s where C Jump comes in for the win. 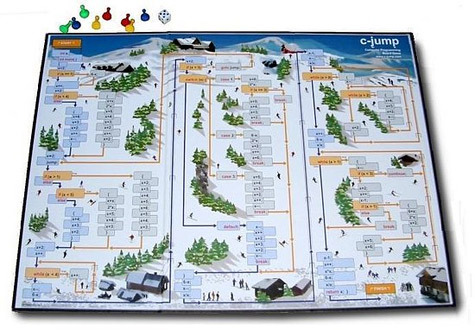 Made for children 11 and up, C Jump is a board game (even geekier than other board games we’ve seen) which teaches kids the basics of C, C++, and Java coding. According to the product page, the “game helps to develop understanding of a complete computer program, formed by logical sequences of commands.” Bribe them to play with McDonald’s. If they don’t play, they don’t get their toy. This is interesting….however, the board’s background instantly reminded me of one of the default games that came on my Samsung phone from T-Mobile about a year ago. It was a skiing game where you had to dodge things. Anyone have any idea as to what I’m talking about, or am I just wasting key strokes? Yes, viper, I recall the game you’re talking about. In fact I loved it! It was included with my HP *years* ago. This is great. My child will get right on that!